William Hill to offer virtual horse racing; will it increase gambling addiction? Anyone who has been to a racecourse will know the excitement when the horses pound towards the finish line. But this thrill of the ride is something that many customers who bet in shops or online do not experience. Bookmaker William Hill is keen to recreate it with virtual reality technology. 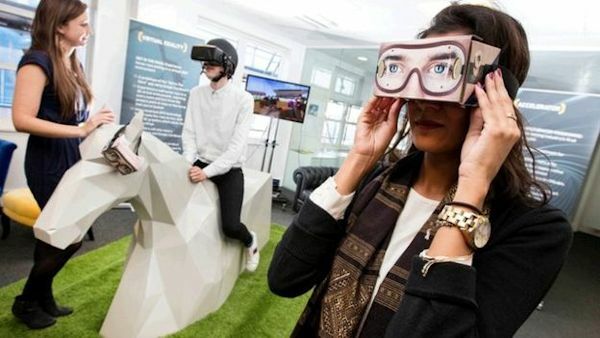 The UK’s Gambling Commission said that it would be monitoring innovations such as virtual reality to ensure that they did not encourage excessive gambling. Using virtual reality headsets, combined with GPS racetrack data, it is giving customers the chance to view the race from the jockey’s perspective. “Currently you place a bet and not much happens between that and the outcome,” said Crispin Nieboer, William Hill’s director of innovation. To test the possibilities, the team at William Hill labs built a 3D mock-up of Kempton Park racecourse and collected live data, via GPS trackers fitted on horses, during a training race at the course. Combining the data created a virtual race users can view via either Google Cardboard or an Oculus Rift. The technology is not yet available to the public but was on show at an open day at the firm’s technology laboratory in Shoreditch. Users first choose the horse they want to race on. Accompanied by live commentary, wearers can turn and look at other horses as well as activating a data display about the horse’s heart rate, stride and race position. William Hill plans to add more courses and live races next year. “Currently there are some gaps in the data so the horses suddenly accelerate in a live race, but we hope to have a proof-of-concept system ready by Christmas,” said Mr Nieboer. The plan is to launch the service as part of the William Hill app. “Users can choose the option to watch the race as a standard video or they can be the jockey,” Mr Nieboer said. It could also be available in some betting shops, said Mr Nieboer, while Google Cardboard headsets were likely to be given out free at racecourses. It is estimated that in the UK about 350,000 people have a gambling addiction, with over £7bn spent annually. The proliferation of online betting has been blamed for making it easier to gamble and some feel services such as virtual reality could add to the problem. The market is regulated by the UK Gambling Commission, which said that it “monitors innovation in the gambling market in order to ensure operators continue to comply with the conditions of their licences”. “Operators are required to ensure that they offer gambling in a responsible manner, which will include offering tools to allow customers to manage their gambling activity as well as having policies and procedures in place to identify potentially problematic behaviour and interact with customers who exhibit that behaviour,” a spokesman added.